After working as a sports writer for over two decades, Bob Greeney found himself among the long-term unemployed. Photo by Maya Binyam. Bob Greeney steeled himself and stepped into the big red suit for a kids’ Christmas party in December 2010. Greeney, a 55-year-old Stamford native, had been unemployed for a year and a half and was doing anything he could to get by: delivering flowers, holding up yardsticks at high school football games, and dealing cards at casino parties. Before his unemployment, Greeney says, he could never have imagined such depths of desperation. For twenty-nine years, he had worked as a sports writer, with newspapers across the Midwest and East Coast carrying his stories. It had been his dream career ever since his college days, when he had broadcast Indiana State University’s basketball games over the campus radio. When, in 2009, the Stamford Advocate cut Greeney and two other sports writers from its staff, he saw a chance to reinvent himself. Thinking that his years of journalism experience offered transferrable skills—“I had a great work ethic and reputation, I could deal with deadlines, and I could write”—he applied to job openings in corporate writing and copy editing. Though he was once one of two final candidates for a United Healthcare writing position, he had little success. Six months after the Santa gig, Greeney became a 99er. Unable to find a full-time job, he had used up the ninety-nine weeks of unemployment benefits then offered to him by the state of Connecticut. Greeney is not alone. Although federal and state legislatures have extended the length of unemployment benefits multiple times, many find themselves in the same position—unable to secure work before the money runs out, even as the economy shows strong signs of recovery. At least five million people in the United States have been out of work for over six months and are therefore considered long-term unemployed. Yet their voices often go unheard in the ongoing national conversation about employment. While government officials and talking heads pick over the monthly reports detailing the numbers of jobs added to the economy, far less attention is paid to an ongoing crisis which has potentially more dire consequences: the dramatic rise of long-term unemployment. According to the Department of Labor, the percentage of unemployed who had been out of work for fifty-two weeks or longer jumped from 5.8 percent to 29.2 percent in the last decade. Re-define “long-term” as being out of work for twenty-seven weeks or longer, and that number rises to 41.4 percent in 2012, according to the National Employment Law Project. But regardless of how they are counted, it is becoming conceivable, even likely, that the long-term unemployed will become the permanently unemployed. Two years after being laid off, Greeney learned about Platform to Employment (P2E), a new jobs initiative based in Bridgeport. P2E offers five weeks of career coaching, social media training, and confidence-building workshops, followed by an eight-week paid work experience, which, ideally, leads to a full-time position. He enrolled in P2E in August 2011 as a member of its first graduating class. Some local resources had previously existed for those seeking work. The WorkPlace, the nonprofit that designed and administered P2E, operates a system of career centers throughout southwestern Connecticut. Providing job listings, training referrals, and career counseling, the WorkPlace seeks to be a resource for populations who have an especially challenging time finding employment, including veterans, the prison re-entry population, dislocated workers, and disabled workers. President and CEO Joseph Carbone founded P2E to address the distinct and urgent needs of the long-term unemployed. In 2010, the U.S. Department of Labor estimated people unemployed for twenty-seven weeks or more only had a 10 percent chance of finding stable work in a subsequent month. Against these odds, P2E presents a remarkable success rate: since its founding in May 2011, 69 percent of its graduates have secured full-time work. To improve its participants’ prospects, P2E tackles the emotional turbulence of long-term unemployment, then works to make its participants more attractive to employers. More importantly, the program works to make the long-term unemployed visible again. Though Greeney’s story mirrors the plight of millions of other Americans, he and his fellow members of the pilot program were chosen carefully. To find its first one hundred participants, the WorkPlace contacted the last 1,400 people who, according to the Connecticut Department of Labor, had run out of unemployment benefits. The selection process included an online application and an interview, ultimately netting a diverse sample of Connecticut’s long-term unemployed: former investment bankers and factory workers, people with master’s degrees and people with only high school diplomas. But while The WorkPlace wanted to avoid cherry-picking candidates, they still selected for evidence of active job searching and readiness to re-enter the workforce. Participants in Platform to Employment were chosen carefully by the Workplace. Photo Couresty of P2E. Many are in desperate need of a lifeline—and through no fault of their own, economists say. Even as the stock market has risen and overall unemployment has fallen in recent years, one section of the labor market has struggled even to get their resumes seen: the long-term unemployed. A recent study showed that more-qualified applicants who had been out of work for at least six months got fewer callbacks from employers than less qualified applicants who had been out of work for less time. Some employers explicitly exclude job applicants based on the duration of their unemployment, a practice that is both widespread and legal. What results is a vicious cycle in which the people most desperate for a job are effectively barred from the workforce. Economists warn that the long-term unemployed may soon become unemployable. P2E seeks to intervene in this cycle in two ways. 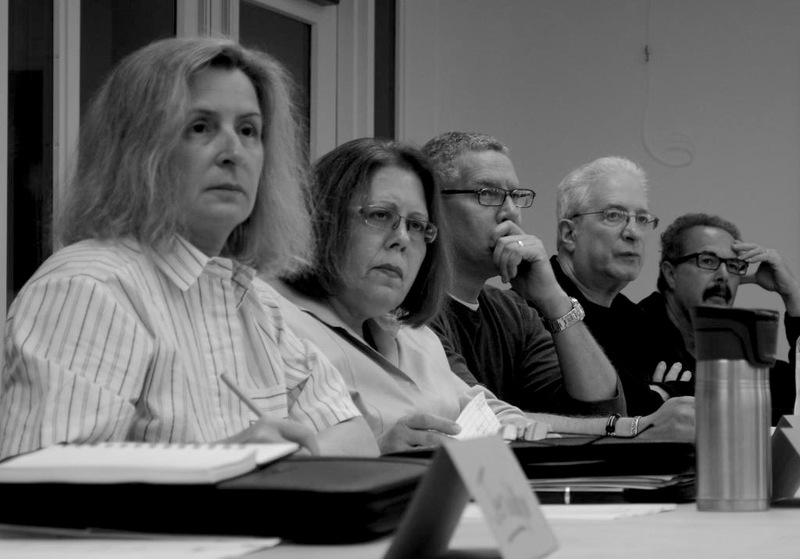 The first phase, designed to address the debilitating frustration that many of the long-term unemployed experience, consists of approximately one hundred hours of training sessions that Carbone hopes will build participants’ self-confidence. Seventy percent of the class sessions are devoted to the “psychology of careering,” a process of guided self-reflection to better the job search . The rest covers the basics of getting a job: interviewing, resume and cover letter writing, social media, dressing for work, and telephone etiquette. The psychology of careering revs people up to fully take advantage of those networking skills that are, in some ways, the most central component of the class. The second phase of the program is called a “paid work experience,” and pairs a graduate with a business for an eight-week trial period. This time provides participants with an opportunity to prove to themselves and to employers that they can work again. P2E pays the first four weeks’ wages to make the arrangement more appealing to employers. Eighty-seven percent of P2E graduates are hired by their employer at the end of eight weeks. Part of the training program directly coaches participants to reclaim control of their lives. After months of job-searching at home, they get back on a schedule: they wake up in the morning, dress in professional attire, and come to class for six hours a day, four days a week. Carbone’s own experience with unemployment inspired the program’s philosophy. For eight and a half months in 1990, Carbone struggled to find work, spending his afternoons watching soap operas. He drove to grocery stores twenty miles away to avoid seeing people he knew and having to explain why he wasn’t working. Six months into his unemployment, he was up for a second job interview. On his way to the interview, his wife called him with a message he had missed: the interview was cancelled because the job had been filled. Carbone barely cared. He said he looked at his watch and thought to himself that, if he hurried home, he could make General Hospital at 3 p.m. In retrospect, Carbone is horrified by the complacency he once felt about his own joblessness, but he says that he would not understand the emotional strain of long-term unemployment if he hadn’t experienced it himself. These days, Carbone is the picture of career success, in his suits with collared shirts buttoned up to the neck. But when he starts talking about the fate of the long-term unemployed, his composure cracks. His voice trembles, his forehead wrinkles, and the skin around his eyes reddens. What upsets Carbone most is that the 99ers come to believe something is wrong with them, when even economists struggle to describe why employers have marked them unworthy of a second chance. Carbone barely contains his tears, his language taking a suddenly aggressive turn as he compares the situation to untreated cancer, the disease worsening and spreading. “We are complicit in sacrificing [the long-term unemployed] in the transition from the pre- to the post-recession economy,” he says. Helen McKee feared she was headed down that path. In October 2009, she was laid off by the Bridgeport distributor of jewelry and dental supplies where she had worked as an accountant for thirteen years. A single mother of two teenagers, she survived on unemployment benefits and the little cash she made doing work for friends—babysitting, cleaning houses, washing windows, and making sales calls from home. The layoff, she says, shoved her from the lower-middle class to the lower class. Eventually, her children needed scholarships from their high school to continue playing varsity sports. Her son couldn’t get his driver’s license because she couldn’t afford the lessons. The family received subsidized heating. They gave up cable TV, vacations, cell phones—and then, fresh meat, fruits, and vegetables. She started going to food banks. McKee estimates that she applied to over fifty jobs, some below her skill level and some in areas so unsafe that her friends prayed she wouldn’t get them. She was called for only two in-person interviews, and never got a job offer. McKee suspects that she was discriminated against because of her age and unemployment. She felt defeated. Then McKee read an article about Platform to Employment and, willing to try anything, filled out an application. According to McKee, she was the last person to be accepted to the class that began in October 2011. She never missed a single training session. 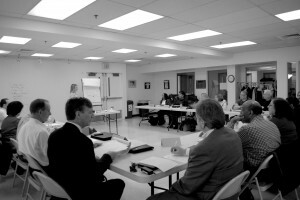 Participants in P2E training sit in a class designed to re-instill a sense of confidence. Photo Courtesy of P2E. One goal of P2E training is to teach participants to think of themselves as brands, in order to better promote their unique set of skills and abilities. To that end, they complete activities such as the “Fruit Tree Exercise.” Presented with a blank picture of a fruit tree, they write their skills on the fruits and their values on the leaves. Such exercises may seem childish, but they are an intentionally simple part of the program’s structured environment for productive self-examination. Right after completing the first part of the program, McKee went on four interviews for the Bridgeport Regional Business Council. They hired her before the eight-week work period even started. She worked as director of finance part-time for ten months and was hired full-time in September 2012. McKee has a renewed sense of personal satisfaction, but says her work pays barely enough to survive. She still lives in housing with no cable and no long-distance phone. Her son left for the Marines in August, so the child-support payments she had been relying on stopped coming. To compensate, she is trying to get a mortgage modification. She expects that she will never be able to retire. That’s not unusual for workers who lost their jobs during the recession. Many jobs regained during the recovery have been low wage. A 2012 study by the National Employment Law Project found that lower-wage occupations made up 21 percent of recession losses, but 58 percent of recent employment gains, creating an unbalanced recovery that researchers warn will cement America’s long-term rise in inequality. Even once they are re-employed, McKee and millions like her continue to struggle. Worse yet, some P2E graduates do not find job placements at all. At seventy years old, Catherine S., who asked to go by her first name and last initial, has a lifetime of experience bringing tourists to Connecticut and New York. The Fairfield County Convention and Visitors’ Bureau, where she was executive director, was shut down in 2009, and she attended P2E thinking she would easily secure a job shortly thereafter. But even though she worked with a P2E job counselor for several months, she remains unemployed. Yet S. she holds that training was valuable. P2E’s insistence upon personal reflection helps its cohorts to become very close, very fast. Seeing that their classmates face the same struggles, participants feel less alone. S. valued that camaraderie. She has kept in contact with McKee since the end of the class almost two years ago. She continues to send in job applications. In February 2012, P2E was featured on CBS’s 60 Minutes. After the piece aired, the WorkPlace was flooded with requests from other organizations coordinating workplace development to start programs around the country, and now P2E is expanding to ten cities. The programs in Cincinnati and Dallas have seen job placement rates as high as seventy-one and eighty-one percent, respectively. The ten-city rollout is a national research experiment funded by Wal-Mart, AARP, and Citi Community Development, part of CitiGroup, to show that P2E can be successfully replicated around the country. To keep the experiment as controlled as possible, The WorkPlace is selecting the participants for each city’s program. But Carbone’s ultimate goals for the program reach even farther. He wants Platform to Employment to become the centerpiece of a national discussion about why the long-term unemployed remain unemployed. In the last six months, Carbone says he has been to the White House, testified before congressional committees, and spoken to Democratic Senators, the National Governors’ Association, the Clinton Global Initiative and local chambers of commerce about the plight of the long-term unemployed. During the 2013 legislative session, nine states have introduced bills that would prohibit discrimination against the unemployed. New Jersey, Oregon, and the District of Columbia already have similar laws on the books. Connecticut Congresswoman Rosa DeLauro sponsored legislation last year that would have prohibited such practices nationwide, but House Republicans decided not to bring the bill up for a vote. If there is any respect in which P2E is a real, replicable solution to long-term unemployment, it is its ability to empower its graduates to change the unemployment landscape themselves. Each graduate who gets a job and performs that job well changes the opinion of one more employer about the skills of the long-term unemployed. Employers’ responses have been fairly positive. A survey conducted by the Harvard Business School Club of Connecticut Community Partners surveyed employers after they had worked with P2E graduates for two months. On average, the employers cited most that they liked the employee’s “positive outlook,” “realistic expectations,” and “eagerness to work.” Eighty-eight percent of the respondents said they would consider hiring another P2E participant in the future. Bob Greeney has turned in his Santa suit for a Metro North uniform. 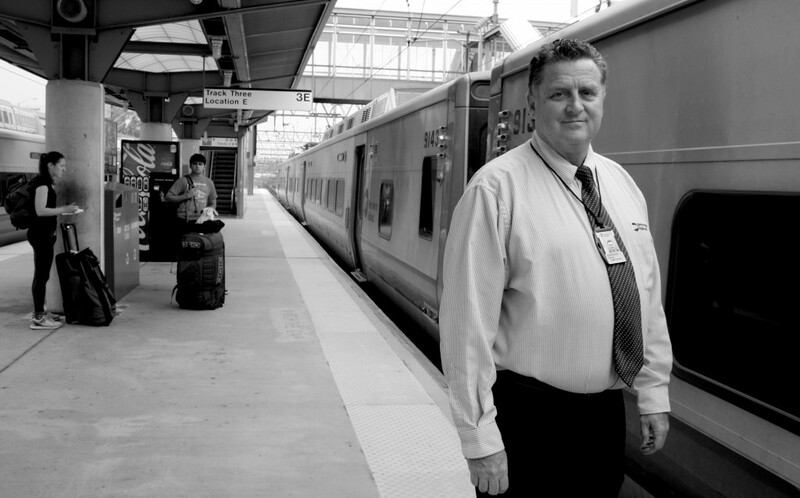 He sells tickets at the Stamford Metro-North Railroad Station from 6 a.m. to 2:30 p.m. five days a week, full-time. He has been with the MTA since May 2012. He enjoys the ten-minute commute to work from his Stamford apartment—until this past June, he had working much further away, at Grand Central Station. On his one-year anniversary of regaining employment, Greeney got a small raise and benefits for dental and eye care. He now makes $21.33 an hour. Annually, that’s a significant pay cut from the $49,000, including overtime and holiday pay he made during his last year as a sports writer at The Stamford Advocate. During what he calls the extra “life hours,” whch he saves with his shorter commute, Greeney picks up odd jobs, like delivering flowers, just as he used to. But even a year later, Greeney is so relieved that he’s made it off what he calls “Unemployment Island,” that he says he can’t complain. Many long-term unemployed can’t say the same, beaten back by politicians who have overlooked them and businesses that continually send them to the back of the line. P2E has reached out, but it will take a lot more to turn the tide. Arielle Stambler is a senior in Morse College.